I mentioned in my last post that I recently got to know the mother of a suspected JDM child, 2 yr old Christopher from Jonesboro. Yesterday, Christopher saw Dr. Pachman in Chicago and he was then admitted to the hospital there and had a port placed this morning. She confirmed the diagnosis of JDM but believes he has some type of JDM overlap condition- a secondary autoimmune disease going on in addition to the JDM. He desperately needs to be begin treatment for the dermatomyositis as he's getting weaker daily, but they can't treat it until they confirm the other condition. The steroids would likely mask the other problem and alter test findings. Please pray that they will figure out what is going on with Christopher so he can begin treatment ASAP! Dr. P told them to expect to be there for 7-14 days so they have a long road ahead of them. Pray for his parents as well as I know they are so anxious and concerned for their little boy. My heart is just aching for them right now. On Sunday, September 12th, Rexy got up super early to take a train to the start line of the Chicago Half-Marathon. Later that morning the kids and I took a cab from our hotel to the finish line to meet up with Rex. There was tons of congestion and great difficulty finding anywhere to park so driving wasn't a very good option. This was the kids first cab ride and first time to ride in a car without a car seat. I, the carseat Nazi, wasn't too comfortable with that but we really didn't have much choice. I couldn't exactly carry around both carseats and push the stroller once we were there. Ruby looked like such a city chic in the cab with her hat and fresh squeezed blackberry lemonade. Waiting for Daddy at the finish line. Great job, Rexy! We can't thank all of you enough for the near $5000 that you donated in support of our son and Cure JM. We're completely overwhelmed and humbled by your love and generosity. After the race we took a train back downtown to our hotel which was yet another first for the kids. Too bad it was hot and jam-packed. We stood in the (my mind has drawn a blank as to what you call that) middle galley part and weren't actually in a train car. Thank you again, family and friends, for your support. We love you all!! While in Chicago we ventured out to Schaumburg, IL to visit Legoland! So cool! There were large "Boy Scout Pine Derby-like" ramps where the kids could build a car out of Legos and race them. A big hit with both! We saw how Legos were made and then got a little souvenir Lego. We also went on a pirate themed ride that reminded me of the Peter Pan ride at Disney World. 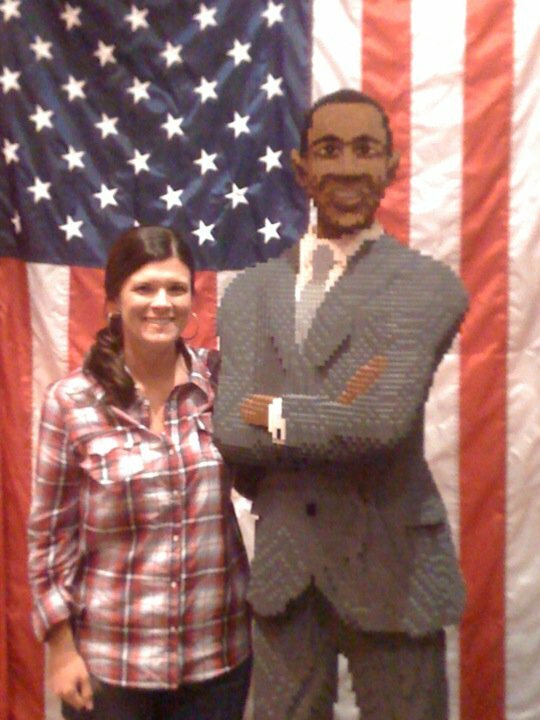 Again- everything was made of Legos. On September 10th-14th we were back in Chicago to see Dr. Pachman and for Rex to run the Chicago Half-Marathon with the Cure JM team. While we were there we hit our usual fun spots, first, the Chicago Children's Museum. Ruby put on quite an entertaining puppet show. And they chilled on the big comphy couch. Later that weekend we went to the Shedd again and Trip was thrilled as always to see the penguins. Can't wait for the new penguin exhibit to open here at the LR Zoo! He loves the submarine too! So glad we went on and bought the membership there. Now that Trip is feeling better we're seeing him blossom in so many different ways. Last week when I picked the kids up from Bible study I was shocked to learn that Trip, not Ruby, had colored this picture. Now every day he's asking to color and is creating masterpieces like his big sis! For the longest we thought it was so bazaar that Trip refused to push the pedals on a tricycle. We would show him what to do, give him a push to get started but he would always insist on scooting it around with his legs. After his JDM diagnosis we realized that it was likely impossible for him to push the pedals. Poor guy! Well, Saturday we took our bikes to the park and he took off! Video evidence is below. Praise God! Last night I was about to leave Trip's room after putting him to bed and he randomly says, "Mommy, I can write my name." What? So I get him out of bed, hand him some paper and a marker and voila! He writes his name. Again, video evidence below. After I put him back to bed I found this Grandparent's Day card in his backpack with a note from his teacher saying "We were so impressed that Trip can write his name!" So, sorry grandparents, I think I'll have to keep this one in the special Trip box. ......Way to go, Trip! We're so proud of you and your recent accomplishments! Preschool is finally back in full swing. Yippee for all! Ruby is now 5 but since she has a summer birthday we decided to hold onto her 1 more year. "Bye, Mommy! See you later!" I think this post is pretty self-explanatory. It's always a fun time with Vivian & Bauer!